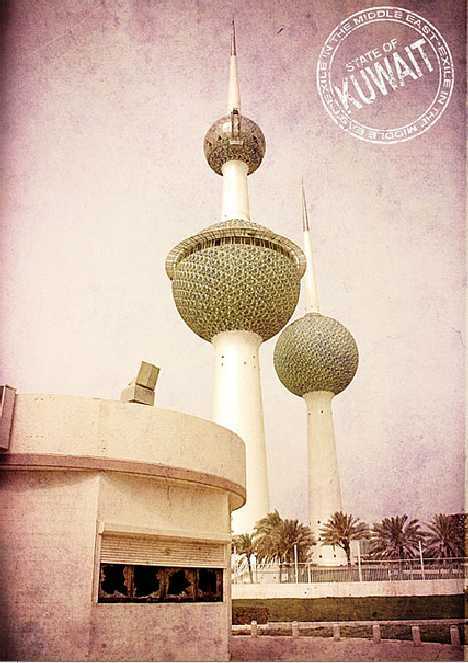 Kuwait officially achieved independence 50 years ago today, so please join us in celebrating the country’s most famous architectural monuments, the Kuwait Towers. 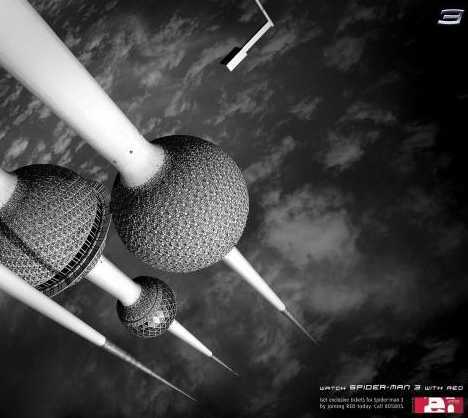 Designed by Swedish architects and built by a Yugoslav construction firm in the 1970s, this trio of soaring spires spearheads the tiny, wealthy Persian Gulf nation’s march into a second half-century of oil-based prosperity. 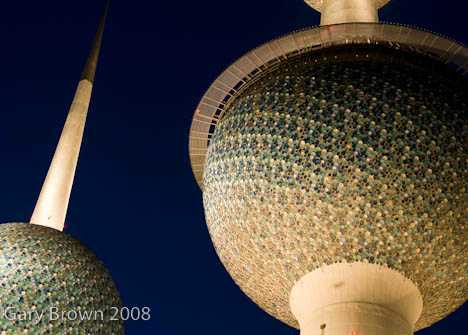 The Kuwait Towers (Burjan al-Kuwait) are located in downtown Kuwait City, just off the seaward side of Arabian Gulf Street. 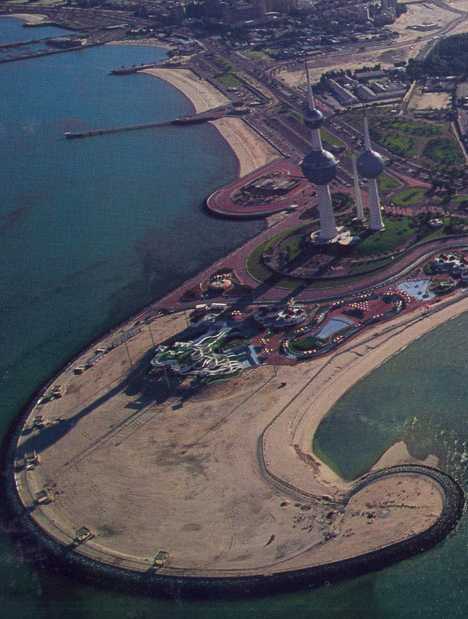 They occupy a promontory shaped like the curled haft of a traditional dagger that juts into Kuwait Bay. 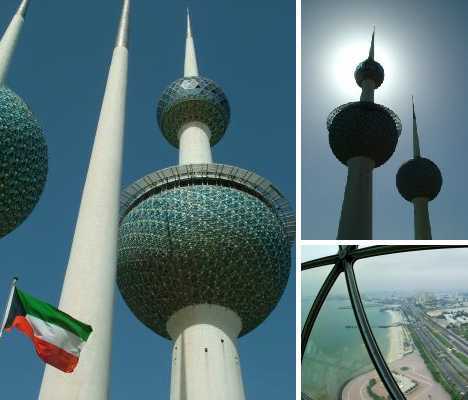 There are no other highrise buildings in the general area of the Kuwait Towers, which contributes to their easy visibility and popularity with photographers. 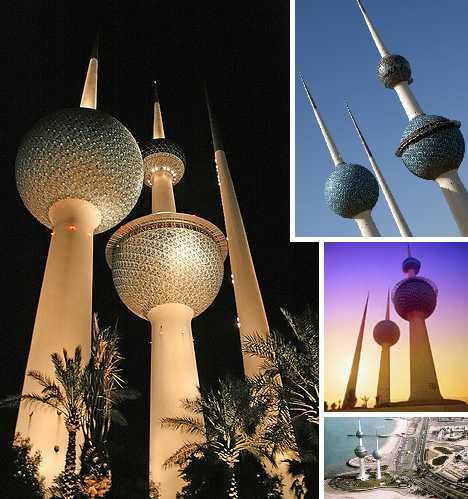 Since the Kuwait Towers officially opened in March of 1979, they have come to symbolize the wealth and prosperity that has boosted this formerly sleepy backwater into the world’s eleventh richest country per capita. The reference to “liquid gold”? It obviously refers to Kuwait’s immense oil wealth: although it ranks just 157th by size, the country boasts the world’s fifth largest oil reserves. It can also refer to water, a precious commodity in this hot, dry, desert country. 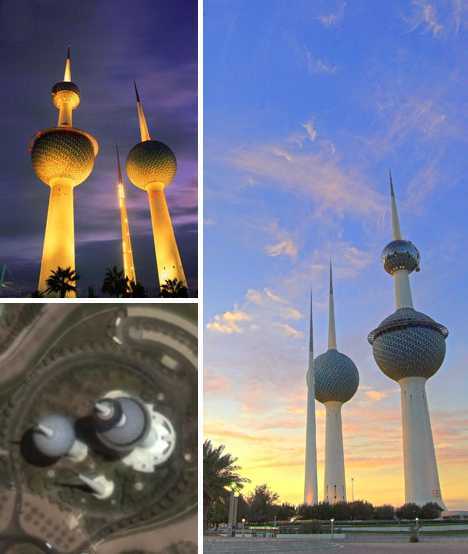 Though they may not look like water towers, storing water is actually the primary function of the Kuwait Towers: two large spherical tanks on the towers hold a combined 4,500 cubic meters (158,915 cu ft) of water. 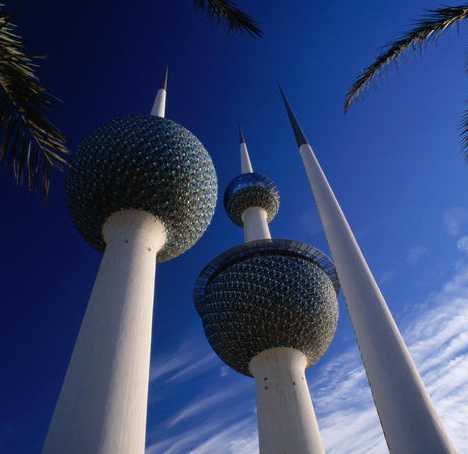 The idea of building the Kuwait Towers dates back to 1962, less than a year after Kuwait achieved its independence from Great Britain. The design by Swedish architects Sune Lindström and Malene Björn of Vatten-Byggnadsbyzan (VBB) received official approval in 1971 and when it finally came time to put shovels to earth (or sand, in this case), Belgrade-based contractor Union-Inzenjering was called in with most of the structural work performed in 1975 and 1976. 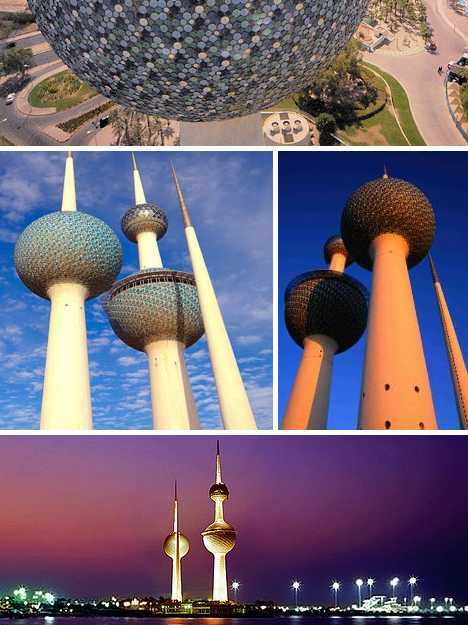 The Kuwait Towers pleasingly express a combination of modern architectural themes and traditional Islamic design, with comparisons being made to slender minarets and the blue-tiled mosques of Bukhara and Samarkand. 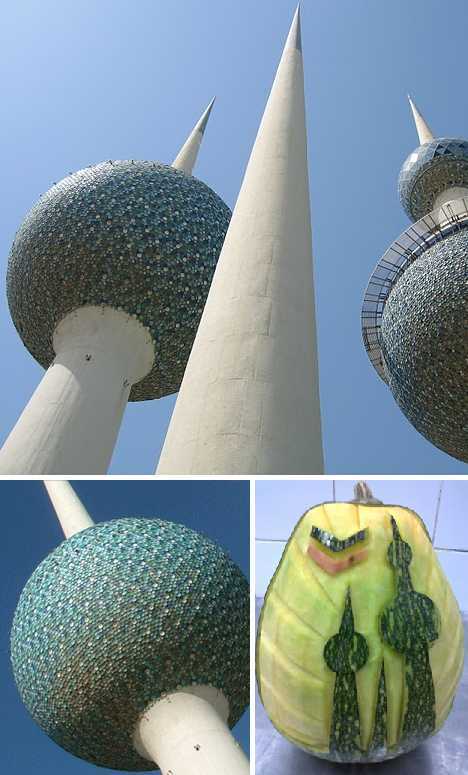 In the case of the Kuwait Towers, however, instead of ceramic tiles the spherical exteriors of the water tanks are covered by 55,000 circular plates of Chinese steel tinted in eight different colors. The concrete portions of the towers are painted white and are tipped with aluminum for protection from lightning. 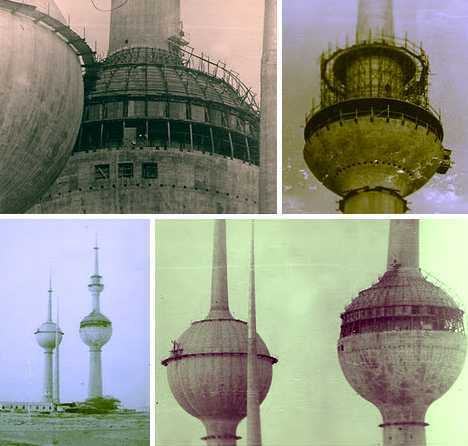 In 1980, the Kuwait Towers were awarded the coveted Aga Khan prize for Islamic architecture. All three towers are mainly made of reinforced concrete but that’s where a little individuality sets in. Let’s crunch some numbers: the main tower is the tallest of the trio, standing 187 meters (613.5 ft) in height. 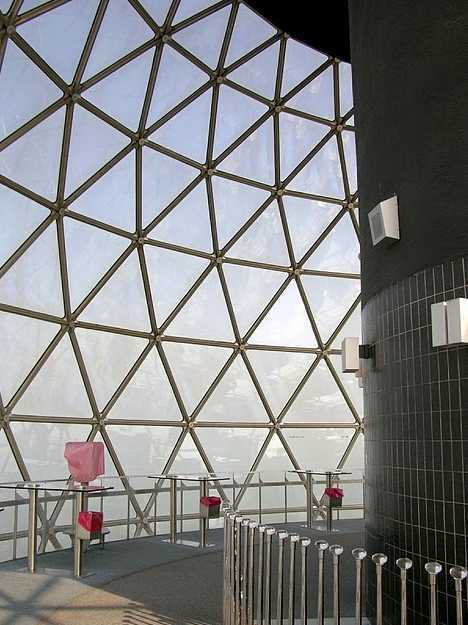 A large water tank is built into the main tower’s lower portion and just above it, at the 82 meter (269 ft) mark, you’ll find the Ofok Restaurant and two other eateries. 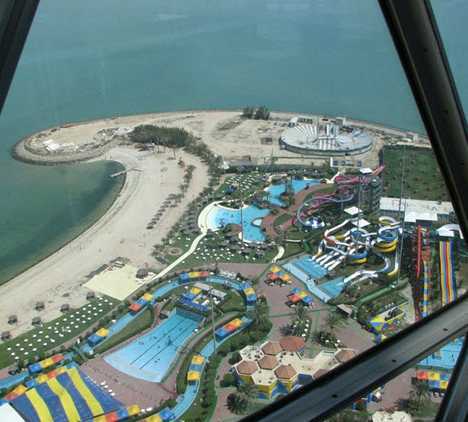 Higher up on the main tower at the 123 meter (403.55 ft) level, a second, smaller “Viewing Sphere” rotates once every half hour giving visitors on the observation deck a magnificent 360 degree view of Kuwait City and its environs including the nearby AquaPark. 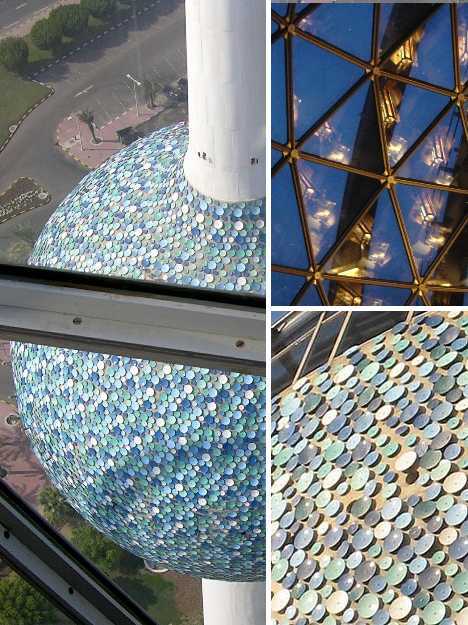 The 145.8 meter (478.35 ft) high second tower serves purely as a water tower with a capacity of one million gallons. The third, or “small” tower, standing 113 meters (370.75 ft) high, contains electrical equipment and a bank of lights that illuminate the other two towers at night. The First Gulf War began on August 2nd, 1990, when Saddam Hussein of Iraq invaded Kuwait on the pretext of seizing back his country’s “lost 19th province.” It wasn’t until mid-January of 1991 that American-led coalition forces began air bombardments against the Iraqi Army and following a 100-hour ground campaign that began on February 25th, Kuwait regained its sovereignty. 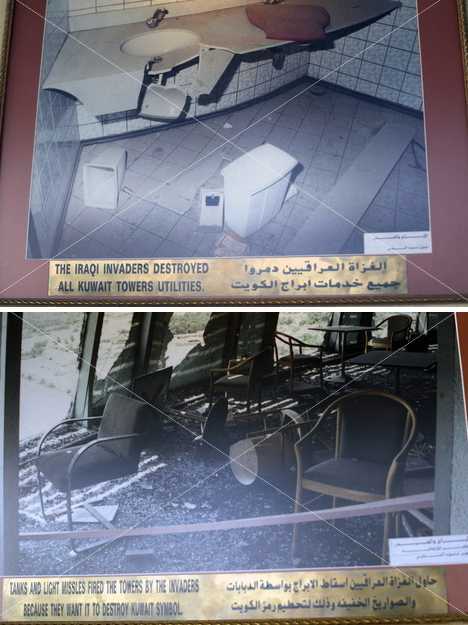 Seven months of Iraqi occupation, however, had left an ugly mark on Kuwait. 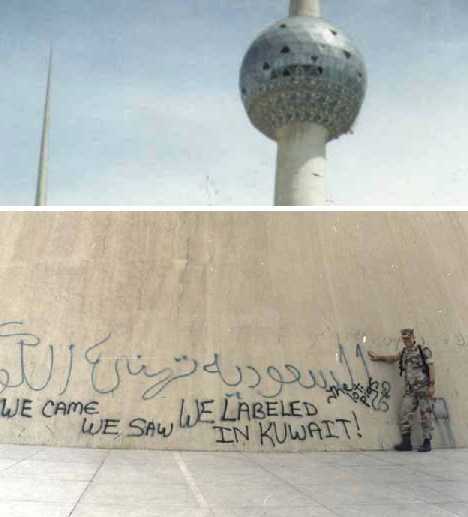 Lest we be accused of overly demonizing the Iraqi’s, let the record show that Coalition forces made their own mark, as it were, on the Kuwait Towers. 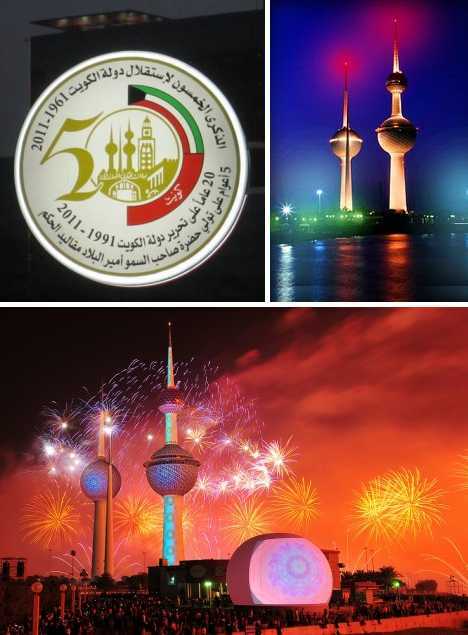 Although the 50th anniversary of Kuwait’s independence occurs on June 19th, 2011, the country has denoted February 25th as Kuwait’s National Day and February 26th as Liberation Day. 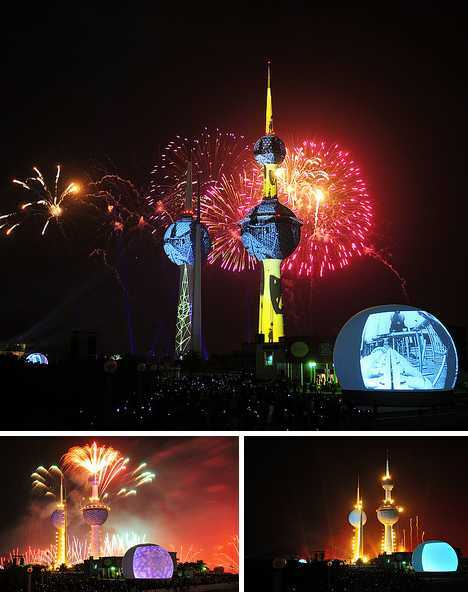 Can we expect the sky above Kuwait City’s waterfront to be lit up with fireworks once again on June 19th? 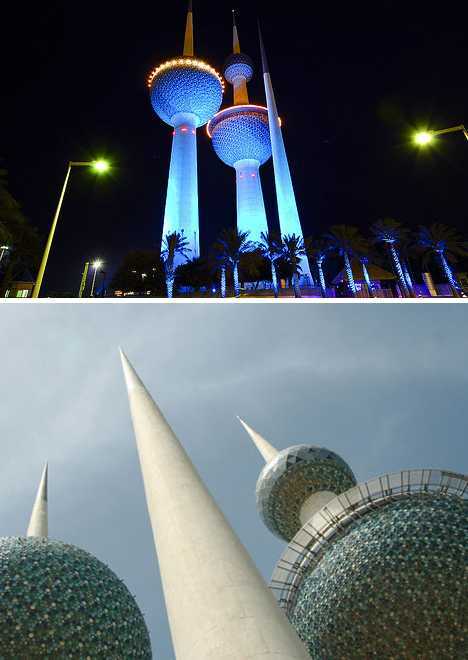 If so, you can also count on the Kuwait Towers taking center stage in the celebrations, as over the past 30-odd years they’ve emerged as the most famous visual symbol of the nation. Thanks to Cajie (Cajetan Barretto) for both capturing the strikingly sublime beauty of this year’s celebrations and posting them online for all of us to enjoy and appreciate! 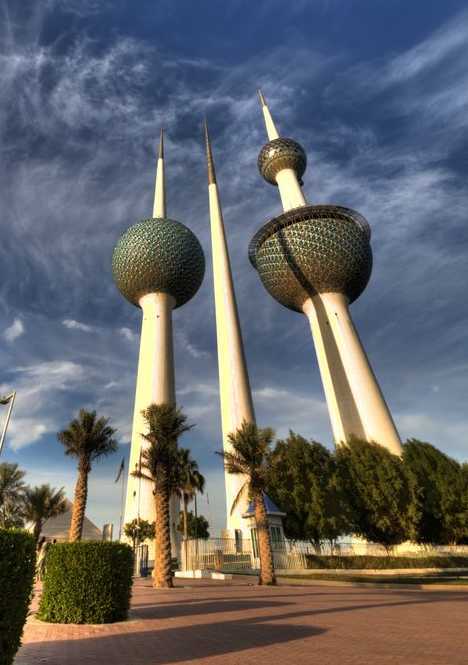 Though a host of new and soon-to-open skyscrapers will eclipse the Kuwait Towers in height, the waterfront trio won’t give up their symbolic resonance as easily. 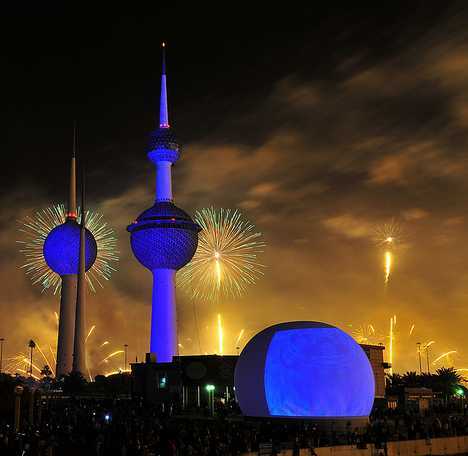 When in 50 years celebrations begin in honor of Kuwait’s centennial, it’s certain that the iconic Kuwait Towers will not only still be standing, but will stand tallest in the hearts and minds of Kuwait’s people.